Suchindram Anjaneyar Temple : Suchindram Anjaneyar Temple is also called as Thanumalaya Perumal temple, Hanuman temple. It's a belief that Lord Shiva stayed at Suchindram Temple when Devi came for self-punishment at Kanyakumari. Suchindrum is located 6 km south-east to the district capital Nagercoil and 13 kms from Kanyakumari. Suchindram is lying between Nagercoil and Kanyakumari main road. This Hanuman Temple situated in a village of Suchindram and is famous for its sculptural richness and tall tower known as "gopuram". This gopuram is large, white colored, sculptural and 40 meters in hight. 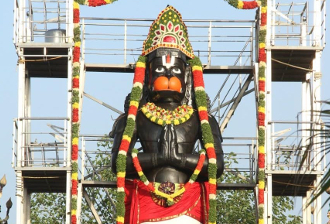 There is a large Hanuman statue is the main attraction in the temple and "vada mala" pooja is special for this Hanuman. The statue is 18 feet high and depicts 'visuvaroopam'. Hanuman Temple is dedicated to Sri Thanumalayan. The place dedicated to the Trinity is Shrine which is known as "Thanumalaya". The name Thanumalaya is came from the combination of Thirumurties "Siva", "Vishnu" and "Brahma" as. 'Thanu' represents Siva; 'Mal' represents Vishnu and 'Ayan' represents Brahman i.e. Siva, Vishnu and Brahman in "One Form". Based on the ancient belief, top, middle and base of the "Linga" is represent as Sive, Vishnu and Brama respectively. There are two important festivals every year; one is in the tamil month of Markazhi (December/January) and the other one is in the tamil month of Chiththirai (April/May). During the Markazhi festival, there is car festival on the 9th day; the deities are taken out in procession around the streets on three festival cars.